Dodgers GM Ned Colletti hit the Internet this morning and purchased three years of a 230-pound short stop for a mere $21 million. I bought an ironic $10 t-shirt from Threadless. At least my t-shirt will be useful in a year. Juan Uribe inked a minor league deal with the Giants in 2009 after a replacement level performance the prior season with the White Sox. 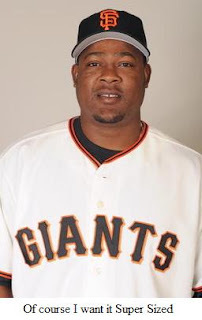 Uribe posted a career best .329 OBP in '09 which earned him a $3.25 million deal with the Giants in 2010. 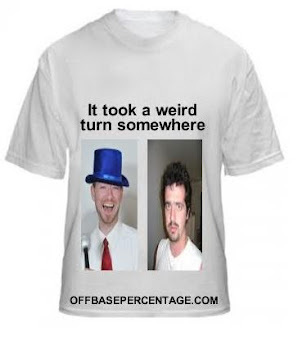 If Colletti was checking with Fangraphs, Uribe was worth $12.7 million in 2009 and $12.9 million in 2010. So perhaps Colletti figured at $7 million per year, he stumbled upon one of those crazy Internet post-Thanksgiving deals. But something tells me giving a middle infielder on a the wrong side of 30 with a hungry-hungry-hippo appetite and a career .300 OBP $21 million is a poor use of company resources. The Dodgers will presumably slide Uribe over to second base with Rafael Furcal still manning short. This also makes Ryan Theriot an easy non-tender candidate in Los Angeles. Uribe provides some power from the middle infield position since he usually hovers around the 20 home run mark each season. Still a 3-year, $21 million deal is a dicey contract considering Dodger dogs are delicious and Uribe might be the fattest second basemen in the history of baseball by next year's All Star Game.